Making Vet Visits Fun? Why Not?! Lobo is nervous at the vet’s office. Our Lobo is a bit nervous at the vet. Being a rescue dog with a hazy past, we have a hard time separating fact from fiction with what we have been told about him. What we do know is that not long before we started to foster him, he was taken to the vet because he had injured himself trying to escape the room he was left in overnight alone. His mouth and paws were bloodied (it breaks my heart to think of it) and he had to be muzzled at the vet because he was in such an agitated state. This was before we met Lobo. Our first visit to the vet with Lobo was just a meet and greet, not an exam. He glued himself to the exit door of the room. He even squeezed between Rob and the back of a tiny chair. He wasn’t aggressive but he wasn’t friendly. The second visit was for a rabies shot for Lobo. The vet’s office insisted on an examination as well and our usual vet wasn’t in that day. The other vet was fearful because Lobo bared his teeth at her and she had us put a muzzle on him for the exam. I wasn’t happy with this but I guess I can’t blame her for being nervous. He’s a big boy and he can be a bit of a loud mouth. 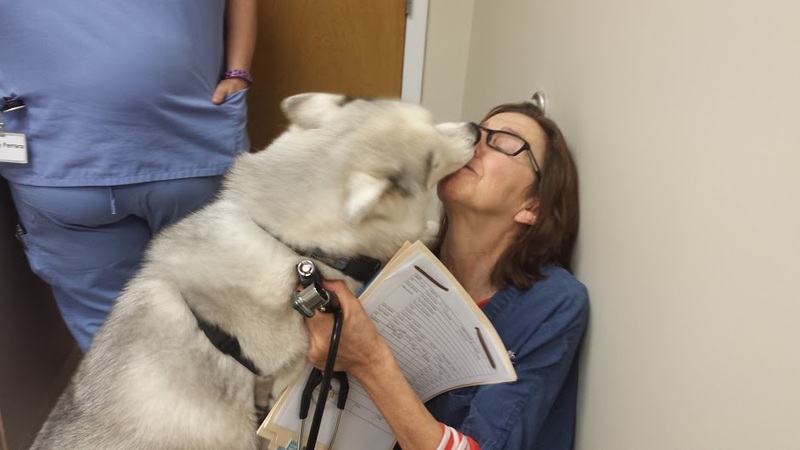 Fiona smothers her doctor with enthusiastic kisses. 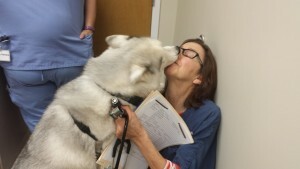 Truly Lobo is “a big mush,” as more than one person has told us about him. Our two girls Fiona and Secret love their vet excessively and we want Lobo to have the same experience. Rob and I have always felt that the vet-pet relationship is so very important because an animal must be comfortable with the doctor and the doctor’s office in order to be well-examined, cared for or diagnosed. 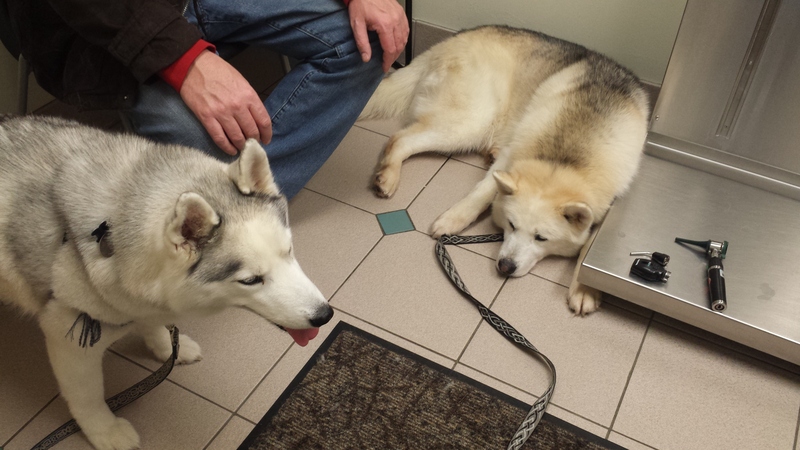 This weekend, Fiona and Secret were scheduled to see the vet for an exam and shots. We wanted Lobo to see how much they love their vet. To bring the experience up another positive, emotional notch, we picked up two Wendy’s hamburgers en route to the appointment. 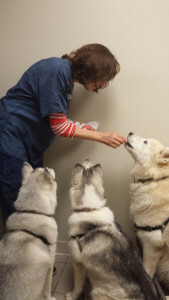 We gave them to the vet to share among the three dogs. Lobo looks at the doctor adoringly – more hamburger please! Lobo must have thought he was in heaven! This nice lady with a stethoscope was giving him hamburger and petting him. He looked at the doctor adoringly and ultimately threw himself across her foot as he lay on the floor. 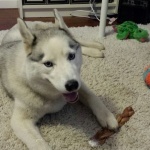 Our hope is that when we go back in a few months for a checkup for Lobo, again with hamburgers in hand, that Lobo will associate the office and the vet herself, with a positive experience, and allow himself to be examined easily. The poor boy’s teeth are a mess from his days and nights left alone and trying to escape, so they will need to be seen to in the near future. All in good time. We are going about this gradually to give Lobo the best chance for stress-free healthcare. I’ll keep you posted on our progress! This vet-apprehension is a new experience for us. If you have any comments or suggestions, I would really love to hear them!! Sabrina was a great traveler! 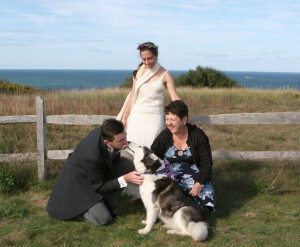 Our girl Sabrina was an amazing husky. She traveled with us all over the US. My husband was racing a BMX bike so in the summer, spring and fall, we were outdoors at races in New Jersey, New York, Pennsylvania, Virginia, Ohio, Kentucky, Massachusetts etc. We would set up our canopy, bring lots of water, ice and a battery operated fan for Sabrina to help her stay cool. I also had a business selling Irish books and would set up shop at Irish festivals across the east coast. Sabrina would come along of course -she was quite a draw at the booth, with those blue eyes! And the Irish wolfhounds which invariably came to the festivals got along with her fine, even though she looked like a wolf as most huskies do! We knew our girl very well. One thing she loved above all else was popcorn. When we drove long distances in the car, we would throw popcorn to her in the back seat to catch. At home we shared popcorn all the time. So when she turned up her nose at popcorn one night, we knew that something was seriously wrong. Sabrina was lying in her crate and would not come out. We placed a trail of popcorn from within the crate, to the foot of the couch where we were sitting, worriedly watching her every move. Or lack of a move. She would not budge from her little cave. I looked at Rob and he looked at me. He picked up the phone and called our vet – we’re coming in now! No desire for popcorn – something is definitely amiss. Luckily we have an excellent, twenty-four hour veterinary hospital only ten minutes away and we drove down there at 11 o’clock at night with Sabrina. After a few hours with the emergency vet and techs, we discovered that Sabrina had a grapefruit-sized growth on her spleen. They scheduled surgery for the next morning to remove it. Once they removed it, we had to wait anxiously for several days for the test results to come back to see if the growth was cancerous. Thank God, it was not. Had we waited, that growth on Sabrina’s spleen would have burst, and Sabrina would be dead. She was twelve at the time and lived to bless us with four more wonderful years of love and affection. What saved Sabrina were a few things. First, our luck to have a good vet nearby. Second, the vet on duty (who became our doctor until this day – the dogs worship her!) had excellent diagnostic skills and pinpointed the problem immediately. We credited her with saving Sabrina’s life and rightly so. Most of all what saved Sabrina was our being observant and noticing her change in behavior, recognizing it as significant, and acting on it. Dogs cannot speak. We need to hear what they are saying by what they do and what they don’t do, what they are doing or not doing that is different from the norm for them. I know a trip to the vet can be scary for some dogs and expensive for humans. The only way to know if a change in behavior requires medical attention, is to have a of expert eyes take a look at your sweet canine. Sabrina as our flower dog! Sabrina lived to happily continue traveling with us for four more years, and to be the flower dog at our wedding. I am still learning to speak my fur babies’ language. I am so very grateful that Sabrina taught me the valuable lesson that actions (or lack of) do indeed speak louder than words.